Be careful, our phones and tablets may be causing more damage than originally thought. 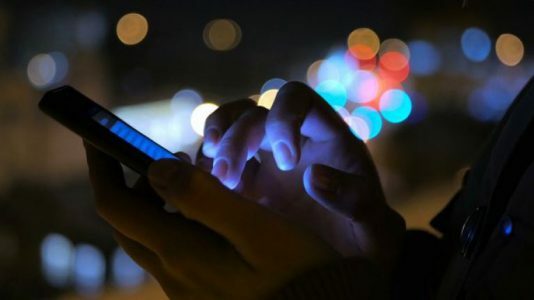 Scientists say they have discovered how blue light from smartphones, laptops and other digital devices impairs vision and can speed up blindness. Research by the University of Toledo in the US has revealed that prolonged exposure to blue light triggers dangerous molecules to be generated in the eye’s light-sensitive cells that can cause macular degeneration – an incurable condition that affects the middle part of the vision. Blue light, which has a shorter wavelength and more energy compared with other colors, can gradually cause damage to the eyes. Dr. Ajith Karunarathne, an assistant professor in the university’s department of chemistry and biochemistry, said: “We are being exposed to blue light continuously and the eye’s cornea and lens cannot block or reflect it. Macular degeneration, which affects around 2.4% of the adult population in the UK, is a common condition among those in their 50s and 60s that result in significant vision loss. Age-related macular degeneration is the leading cause of blindness in the US and while it does not cause total blindness, it can make everyday activities such as reading and recognizing faces difficult. Photoreceptor cells need molecules called retinal to sense light and trigger signaling to the brain, enabling us to see. The researchers found that introducing retinal molecules to other cell types in the body, such as cancer cells, heart cells, and neurons, caused them to die off when exposed to blue light. The scientists found that a molecule called alpha-tocopherol, a natural antioxidant found in the eye and body, stops the cells from dying but fails to offer any protection to the aging population or those whose immune systems have been suppressed. “That is when the real damage occurs.”accoridng to Karunarathne. For those wanting to protect their eyes from blue light, Dr. Karunarathne advises wearing sunglasses that can filter both UV and blue light outside and avoid browsing on mobile phones or tablets in the dark. Original Article Found on TheGuardian.